UPDATE to the Update! I Won’t Have to Stop Selling physical products to Colorado customers as of December 15, 2018 — No! May 31st, 2019, only because This is True is actually in Colorado …but (sigh!) I might have to in 2020. Jump to the Update or read on. As you might remember, the U.S. Supreme Court decided in June that each state can now require sales tax to be collected on Internet sales of tangible goods — that even if a retailer doesn’t have “nexus” in a state, the state can require them to collect sales tax since “significant” sales creates that nexus. The “nexus” idea was the point of a 1992 decision that essentially exempted out-of-state online retailers from collecting taxes where the had no presence. “Significant” (according to the ruling) seems to be $100,000 worth of sales to any particular state, or 200 or more sales. With the new ruling, Colorado will soon require online retailers to collect sales tax according to the recipient’s address. But get this: there are 683(!) sales tax districts in the state. Colorado says they’ll follow that $100,000 exemption limit for large out-of-state retailers (and make no mistake: anyone selling $100,000 worth of tangible goods just to this one state of 5.6 million residents is “large” in my book! ), but there is no exemption for small in-state retailers: if we ship within the state, they are requiring us to charge the exact correct amount according to the specific delivery address. So there will need to be a data base that details which of the 683 tax districts gets how much tax according to that address, and which has to be available 24×7 for instant answers because buyers are impatient enough already when dealing with online shopping carts. I am not aware of any plugin for True’s shopping cart that will do that accurately at this time. And if there is one, I doubt it would be cost-effective for the extremely small amount of in-state physical-product sales we do. And even if there is an accurate free data base, that doesn’t overcome the next obstacle: 73 of those 683 taxing districts require direct payments, which means getting an account set up in that district, rather than just submit the payment through the state portal. There is a company offering to do it for us “from $9.26 per filing.” That does not help small retailers like True, which does a very small amount of taxable sales: the total of Colorado sales taxes we collected for the entire state for all of last year was just $18; the vast majority of our sales are out of state. Yet if we end up owing 70 cents in tax from a $12 pack of Get Out of Hell Free cards to a specific non-state-collected taxing district, we’re supposed to pay $9.26 (or more, with our small volume) to send them that 70 cents? Nope: Ain’t Gonna Do It. My only alternative so far is to shut down all sales of tangible (shipped) goods to Colorado addresses until the state pulls its head out of its …uh… actuary tables. This implementation by Colorado actually favors out-of-state businesses over in-state businesses, all in an effort to make online retailers pay their “fair” share of taxes. 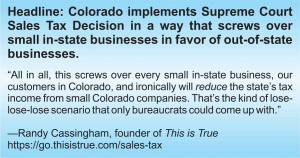 All in all, this screws over every small in-state business, our customers in Colorado, and ironically will reduce the state’s tax income from small Colorado companies. That’s the kind of lose-lose-lose scenario that only bureaucrats could come up with. It’s right up there with the last time the state did something stupid in this realm: despite seeing that Amazon immediately canceled the affiliate relationship with businesses in state after state after state that tried to force Amazon to collect sales taxes by declaring that affiliates created nexus (despite the 1992 “nexus” ruling), Colorado’s lemming-like legislature passed a law to declare that Amazon affiliates created nexus for Amazon. 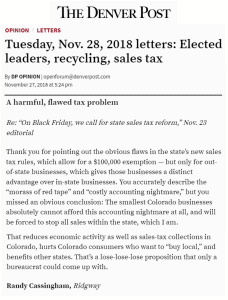 Sure enough, as everyone but the legislature expected, Amazon immediately kicked out every Colorado-based affiliate (including us), and the state lost all the tax income from those payments, plus the economic benefit of thousands of small businesses having more money to spend in the state. Absolutely moronic! Still, at least someone is pointing out the obvious burden to the state, because someone at the Denver Post actually thought about the ramifications, unlike the state bureaucrats. This seems to be the default position for every state that collects sales taxes — “Well, OK: we won’t make out-of-state companies collect just a little tax (because it looks like we have to do that per the Supreme Court).” Yet will they also let their in-state businesses twist in the wind? That’s clearly what Colorado is doing. So don’t be smug: if your state collects sales taxes (and the vast majority do), your smallest local businesses are in mortal danger, starting whenever your state decides to implement this. And believe me, they’re wanting to get it going. Colorado couldn’t even wait until January 1! I don’t see that it’s possible for the state to clear this up before this all starts on May 31. Thus, I’ll encourage Coloradans especially to stock up before then on any of True’s physical products, because I’m going to have to refuse in-state orders starting May 31 — again, this is for taxable goods, which means stuff sent in the mail, not email subscriptions. Get Out of Hell Free products. This is True books (including ebooks). …and more. But again, not paid email subscriptions of True’s weekly news commentary newsletter. The state announced a delay in implementation of the new rules until “at least May 31,” so True’s in-state sales will continue until “at least” that date. So maybe this deadline will be extended again. 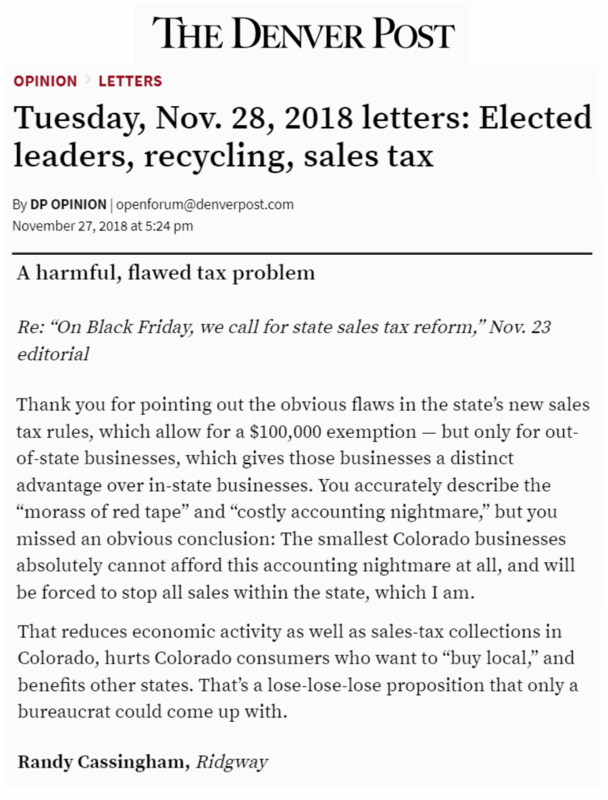 I was far from the only small business in Colorado to point out the obvious flaw in the state’s implementation (see my Letter to the Editor of the Denver Post above). We’ll see if a workable solution emerges: there is at least hope! “The Department of Revenue agrees it is important for the state to take the time to get this right,” Hartman said. Gee: ya think?! But get this: “Despite the automatic reprieve, the Department requests that businesses with the sophistication and capability to collect and remit sales tax on internet sales based on where the good or service is being delivered do so as quickly as possible.” The reality, of course, is that one-man shops don’t have that capability …so now “sophisticated” (aka huge) companies are at a disadvantage instead. That doesn’t happen often! As noted in the section Not Just Colorado! above, this whole thing involves other states, too. Let’s hope other states will learn from Colorado’s misstep. Just after I gave up and decided I couldn’t sell tangible goods to anyone in Colorado, the Denver Post published an update on the situation. First, a bill was passed to require the state to build a “one-stop sales tax platform” that would make it easy for retailers to pay collected sales tax — to the state, rather than force retailers to have accounts in scores of sales tax jurisdictions. Presumably, the state would then pass the appropriate shares on to those districts. Secondly, it would require large online retailers such as Amazon to collect such taxes for the companies that sell through their platform. So the worst-case scenario might be that I would refer such sales to Amazon instead. That’s a pain in that it means giving up a significant portion of profits to Amazon, but at least my Colorado customers would be able to get most of my products. Again, this is a developing situation, and nothing has changed …yet. This page is an example of This is True’s style of “Thought-Provoking Entertainment”. True is an email newsletter that uses “weird news” as a vehicle to explore the human condition in entertaining way. If that sounds good, click here to open a subscribe form. Q: Why would I want to pay more than the regular rate? A: To support the publication to help it thrive and stay online: this kind of support means less future need for price increases (and smaller increases when they do happen), which enables more people to upgrade. This option was requested by existing Premium subscribers. Sadly, this won’t be the only situation where small businesses get hurt by state and local municipalities trying to get their “fair share” of online sales taxes. The oblivious don’t get that a brick and mortar store only has to deal with the one local set of taxes, while an online store will have to deal with hundreds or thousands of tax collecting agencies, each with their own quirks and rules such as direct payments. It will get much worse before there is enough outcry to make it better. There is also another aspect that I doubt that they thought about, do you think that their system could handle the large number of new accounts? I think that the SC got that decision wrong. At most, the business should have to collect sales tax for all sales based on the business location. The complications are enormous. What rate do you charge for a person who orders a gift and has it delivered to another person and the buyer has a physical address and a mailing address? I think California’s law is: if you have a brick & mortar business in a state you have to charge sales tax from customers who live in that state. You must be reading something I’m not. Looks to me like if you sell less than 100,000 dollars then you don’t have to do anything. The functional deadline is now next March 31 — plenty of time for the legislature to correct this if there’s enough pressure. They should make it simple: sales taxes stay in the community where they were generated. They have been putting that out in meetings as well. More importantly, contact your state legislators. They CAN kill this idiocy…before it kills our businesses. I’m sorry, maybe it’s because I live in Canada but I’m having trouble wrapping my head around this. Are you saying that one state has over six hundred separate tax districts, each with its own separate tax rate and separate tax collection policies? Is this common in the U.S.? Who on earth could possibly see this as being beneficial in any way? This is quite common. My wife is a CPA and one company used to pay her to pay their Louisiana taxes and make reports to every single county, every month. Reporting had to be done every month to every county, whether there were sales or not to that county. If the report wasn’t filed properly there was a stiff penalty. Shawn, yep, depending on where you live, there could be multiple “tax authorities”. You could have a state, county, city and “special district” all wanting a sales tax. And, making it even more fun is that each “authority” could have different rules for what is and isn’t taxable. Now imagine trying to handle the sales tax for every tiny jurisdiction in the country, many with different rates, different forms, and even different rules for what’s taxable and what isn’t. Colorado isn’t testing how far the Supreme Court’s Wayfair decision really goes. But it’s not clear that the Court will protect small businesses that sell anything at all into a state from being forced to act as that state’s tax collector. It could be simple if implemented well — in the age of computers it doesn’t matter how many tax districts there are so long as there’s a single submission for all of them and the correct rate is easily determined. For example, if each zip+4 can cover only one tax district it’s easy to select the correct rate from a database lookup table and all a business need do is report total sales to each zip code and remit the correct taxes. The distribution of those funds becomes the state’s responsibility but that’s trivial too. Now this assumes that the rules for what items are taxable are uniform throughout, but variation even there only adds a few more columns to the spreadsheet and a few more hours of software coding up-front (though it would be a nuisance for domestic retailers to suddenly need to add Schedule B numbers to their product listings just to get a correct tax code). 1. Make it easy to figure out the correct tax rate. I’d propose zip+4 and mandate that taxing districts that share a zip code come to a mutual agreement or default to a weighted average rate and distribution of revenues by population. There are probably other workable solutions using existing geofencing technologies as well. 2. Make it a single consolidated tax filing. And minimize the number of times per year that a business needs to file if they’re only collecting a few dollars. Say, less than $20/year — file annually. More than $10,000/year — file monthly. 3. Simplify categories and make sure they’re consistently defined. 4. Provide enough transition time from when the rules are finalized to when they take effect for software developers to do their work. That probably means at least a year. So if I understand you correctly, previously for in state orders, you charged them sales tax based on where you live and paid it to the state? I’ve been operating an online used book store since 2002 in North Carolina. We have to charge sales tax on instate orders based on where it is being delivered to, and keep track of the amount due for each of the 100 counties plus special county and municipal sale taxes. However, we consolidate all that on a single form and remit the total to the state, who divvies it up. I also list my books on different websites that aggregate numerous book dealers and sell everywhere. On at least one such site, they provide no way to charge tax in their shopping cart, so if I need to do so I have to send an additional charge to the customer, which he must approve. This is iffy, to say the least, and if the customer can’t figure out what to do I must decide whether to ship the book and eat the tax myself or decline the sale and lose that money. I recall the multi-state sales tax project that never came to fruition, but they promised to give retailers a fairly clean interface and tax matrix. That would’ve been ok, but the idea of selling to a state with 683 different jurisdictions — that’s crazy. In California we have the statewide rate (6%) and the local rate (1-1/4%.) Many areas have voted add-on rates of 1/4% to nearly 2% for specific needs. In-state retailers must collect and pay the right percentage based upon the point of sale. Generally, this is where title changes, and is the address of the purchaser. This is not unlike Colorado. But we only have about 70 districts. The accounting department thinks you might be able to persuade your revenue department to allow for de minimus sales to be taxed at your statewide rate. Worth a shot to write an impassioned letter! Seriously, Randy, Colorado must have some law somewhere in the catacombs or case law that addresses the undue burdens of recordkeeping by business to comply fully with tax collections of $15 per quarter. Me? I would advise my client of the law. Then, I would suggest collecting and remitting your local rate and ignoring the myriad districts and allocations. The Colo. Department of Revenue has bigger fish to fry (no disrespect). They would waste more resources in pursuing the $12.38 per quarter than they would receive. But, maybe Colorado is more ruthlessly zealous than California! I worked for a sales tax software company. There are no really good solutions for small businesses who sell small orders by mail. What you need is an aggregator who sets up shop and essentially creates a contractual relationship where they are a licensed reseller of your goods and you drop ship for them. Essentially they distribute the overhead of collecting and paying the sales tax. Meanwhile they set up as a non-profit business association…. There have, of course, been City level databases of this stuff for decades. I have no idea, though, that they were going to require you to sign up directly with each small municipality — is that just a Colorado thing or are they doing that everywhere? This is how internet sales taxes will kill small online businesses. A brick and mortar store only has to deal with one state and one local tax authority/collector. A small online store will have to deal with several thousand taxing entities, each with its own rates and rules. Large companies like Amazon and Walmart can handle these issues by the nature of their size. Eventually everything bought online will have to go through an internet behemoth because small companies eventually will not be able to adhere to all the tax rules. And if they miss something, the small business has a thousand entities that could take them to court miles away and drive their business into bankruptcy. If the states were logical, they would adopt a single rate, at least for internet businesses. And one place to remit payments to. If they were even more logical, they would all get together for ONE universal rate. This, of course, would probably lead to more total revenue being collected. We can’t have that! Sorry Randy, I am on your side. I am just trying to be practical and sarcastic at the same time. I may have failed at both. You may be able to skirt the whole thing in this manner… Sell in bulk to affiliates in other states, who then resell to people in Colorado. You can set up your website to reflect this, and redirect to the affiliate’s site where the order will be placed, outside of Colorado. I think this can be done, just as other companies have affiliates in other states. Since the internet is world wide, a location can be anywhere in the world. Maybe you can change your location via your website, and have the merchandise delivered from a state outside of Colorado? Something to look into. I did tax in CO for a few years. It’s horrible at best. I am not hopeful the new representation here in CO will do anything that would reduce their ability to collect additional revenue. Maybe we can barter for goods. The simplest “fix” would be to define the location of the sale based on the seller’s address and not the buyers. That would give you just ONE rate for in-state sales. But I agree, for $600ish of sales to pay $18 of tax it’s just not worth it. It may be time for you to sell through an offshore company. You may think that you have no choice about how much tax you pay. Everyone has to pay taxes, right? Wrong. There are millions of people who legally pay little or no tax. What’s their secret? … They simply understand … that the tax law is not something the government uses only to raise taxes. The tax law is a tool the government uses to shape the economy and promote social, agricultural, and energy policy. These people understand that the tax law in every developed country is now a series of stimulus packages for entrepreneurs and investors. In the United States, over 95 percent of the tax code is intended not to raise taxes but rather to stimulate economic, agricultural and energy activities. In fact, the tax law is a map (or a code) to vast amounts of wealth. And the tax code doesn’t only show you how to reduce your taxes. If you follow the tax law carefully, you will discover that the secrets to amassing huge amounts of cash flow and wealth are found within its pages…. The tax laws are written to reduce your taxes, not to increase them. In the United States, for example, there are over 5,800 pages of tax law [as of 2012, when the book was published—JAH]. Only about 30 pages are devoted to raising taxes…. The remaining 5,770 pages are devoted entirely to reducing your taxes. In other words, 0.5 percent of the tax code is devoted to raising taxes, and the remaining 99.5 percent exists solely for the purposes of saving you money. The key lies in your facts. Your facts include your business activities, your investment activities, and your personal activities. They also include how you keep track of your activities. All taxes are based on your facts and circumstances. So IF YOU WANT TO CHANGE YOUR TAX, CHANGE YOUR FACTS. It’s that simple. That sounds a bit cryptic. But it’s not, really. One of the easiest facts you can change is location — if not your physical location, then, at least, perhaps, the place where you have your business’ transactions take place…. I have a sneaking suspicion, that might be one of the benefits of DalPay. Then there’s the “Taxable or not?” question. Selling a book in some places is taxable, in others, not. And, in NJ I can walk into an Auto Parts store and pay %6 sales tax. And walk into a dealership and either pay 3% or 6% depending on where the dealership is. Or, 0% if it’s a “truck” part. But in that same dealership if I buy a used car I pay full tax. I never did figure out (and I was in the industry) how to deal with tax on a part that might be used on either a car (taxable) or a heavy truck (tax exempt). I’ve been more or less following this, since I have a (so far) very small online/shipped sales presence, at a volume that makes even selling to all fifty states in a year highly improbable. At least I’m fortunate to live in a place where the tax is only about six districts (with only two effective variations), all paid via the state. What I understood is that all states were either destination based or seller based for collecting state sales tax, which leads me to wonder if it was previously officially seller location based, or whether it’s an issue that was previously quietly ignored because everyone knew it wasn’t feasible to work any other way. If this is going to stand (and likely extend to other states), the states should set up systems similar to ASCAP and BMI. As a vendor, you set up an account that applies to all states and send them the sales totals per location. Then they sort it out and send each location the appropriate amount from your account. Politicians and greed. What a combination. I am not an expert, but I remember a person in Balcones Heights, Texas told me that the taxing is done “where the cash register receives the money”. That was back in 1989, and it may not be true today, but it makes a lot more sense. Sounds like the legislature are smoking some of the legal Marijuana…. Hopefully you can talk some sense into them. Clearly, none of them are small business owners. You need to be better represented. Perhaps you might consider running for congress…! I wonder how New York State, 57 counties + 5 in NYC, gets away with fewer than 100 sales tax districts. The most obvious solution is for Congress to actually do some work and (a) establish a flat on-line sales tax to be collected and (b) declare all products and services purchased on-line, including shipping and handling charges to be taxable regardless of place of origin or destination. Payments, reported by zip code of delivery, would go to a clearing house that would accumulate the taxes, keep a very small % of the total, and submit to the states. It would be up to the states to allocate payments to their internal taxing districts. The volume would be high and the clearing house computer system would do most of the work. The clearing house would easily cover cost & profit with 2% or less of the receipts, the states would get at least $98,000 for every $100K reported. On-line sales require computers, a small business keeping a spreadsheet of zipcodes and taxes is not onerous. Besides, Quickbooks and others would soon automate the reporting and big businesses would just add a routine report. Accommodating the various state rules and regulations is expensive, even when using a service bureau to do it. Ask a winery. We’ve been dealing with stuff like this for years if we want to ship wine out of state. But the Colorado answer is so onerous I would also probably stop shipping directly within state. Maybe I would make a deal with an out of state reseller just to maintain goodwill with my in-state people. If you had a single point of collection (like we do in CA) you could do what I do in states where they require me to pay tax based on district – AZ, VA, NC for example. I just collect the minimum from all transactions and then figure it out later when I file. Yes I lose the delta between the minimum and actual, but it’s FAR FAR less than the cost of paying someone to keep track of it. But with 74 places to send payment, you’re screwed. BTW within CA they do NOT require we collect based on the shipping destination. We pay based on our business address, which thankfully is the lowest in CA. I posted a comment on Quora earlier today in response to “What is normal in the US that Britons find weird?” I said that considering the country calls itself the UNITED States, there’s very little in the country that’s united in a lot of respects and this just reinforces that. Over on this side of the pond, things are so much simpler. Sorry Randy, my mistake. I couldn’t give two hoots about Brexit or Theresa May. There’s sod all I can do about it and when I retire in 5 years time I’ll be moving to a non-EU country anyway (but still in Europe). No, what I meant is that you’ve got a situation where one state is making a rule that is only applicable in that state. On my numerous visits to the US, it’s always amused me that state tax differs in each state and sometimes within states in different cities. Or a burger displayed at $1 in McDonalds is actually $1.06 (or whatever) because the price shown doesn’t include the tax. In the UK, if it’s displayed at £1, you pay £1. The United States was created when the original 13 Colonies agreed to Unite as one Country. The agreement worked because each colony was able to retain the freedom to operate their State as they saw fit. Our Constitution laid out what was to be controlled by the Federal Government. Everything else was left to the individual States to decide for themselves. Maintaining this balance of power ensures that citizens of each State can make decisions based upon their wishes and needs as long as their decisions don’t conflict with a Federal law. We are now 50 very unique States United as one Country. Not defending Colorado’s implementation but I used to work for a large brick-and-mortar company, it’s not so easy on them either — especially since the company also did catalog (mail order) and internet sales. (They’ve been dealing with this issue since the 1960’s). 1) We needed a large database of all taxing districts for pretty much the whole country. Any catalog, internet or gift sale had to collect and pay taxes to the district where possession took place. Since the company had a physical location in every State, they’ve always had to pay internet sales taxes (and they were one of the first to do sales on the internet). 2) In many if not most States, its not enough that they tell you the rate, no, they have tax tables you have to use (to makes sure rounding goes their way). So, its not like the rate for District 123 is x%, nope, there’s a whole table for $0.01 to $10.00(?) in $0.01 tax amount increments. 3) As a brick-and-mortar that would accept returns at any location (including catalog, internet, and gift sales), we had to be ready to refund the correct tax amount for any sale being returned anywhere country (and reduce the tax payment to the correct district). Keep in mind, it was often the case that only 1 or 2 items were being returned from a multi-item sale, the correct tax had to calculated on just those items being returned using the correct tax table. 4) Our brick-and-mortar locations sometimes spanned taxing districts. We had to be able to collect different tax amounts at different registers within the same store! (and pay the correct amount to each of the different districts). Had to get that correct on returns as well, even if returned to the same store it might be returned in a different district than the sale took place. These are *some* of the factors brick-and-mortar stores have had deal with for decades, it was a state-provided, state-enforced business advantage that had been given to internet businesses. Its simply not true that a brick-and-mortar store only has to deal with one taxing district unless they are very small and completely local. That said, Colorado’s implementation is idiotic. I am no tax authority, but but couldn’t the internet be declared a seperate entity. Leaving cyberspace to act as a state and collect taxes and fees, then cycle these to maintain the connection. I realize this would require the federal state to take over management of the internet, but it would allow companies to make “toll roads” (ISP’s), or they could use the public roads (state ran ISP’s). This also would make a unified concept of how to do business online. I know it would also create an international state, but maybe that could help foreign start ups? I Don’t really know. Yeah, I thought maybe I had something but it got away from me. I posted still because so e brain out there might find a use. I used to maintain a point-of-sale system at a regional chain of brick-and-mortar stores in Ohio when they passed a destination tax law. Our stores would occasionally ship gift items to other counties, and only a few counties have split tax districts. At least the state had the courtesy to put up a free web service to get the rates for any destination, and rates were just simple rates and not tax tables. I wrote an application to get rates based on customer information during a sale and integrated it into the system. The real kicker is the collection system. The state here had a centralized reporting and payment system. Submitting reports and payments directly to separate systems all over the state is completely messed up. The thing that is perhaps forgotten in all this is that Congress has abdicated its role in this issue. The original Supreme Court involvement, many years ago, recognized that Congress has the ultimate and obvious authority to regulate this, as it is clearly interstate commerce. One of the state project for, what, a couple of decades at least, was to get Congress to pass a national law regulating and normalizing internet sales across state lines. Alas, it fared no better than the parallel project whereby states proposed uniform and simplified methods and rates. Congress has — under both parties — failed to fulfill its clear responsibility to regulate this matter. I am most definitely a small government advocate, but surely this is one case where having a national approach would provide a healthier business environment. Surely it wouldn’t be worse than the insanity we are seeing following the Wayfair decision. For small businesses shipping tangible goods across the country, trying to shift where we ship from is not really an option. For me, it would likely cost more than the books are worth to try and do so. So we have little choice but to knuckle under to the inanities of our legislatures. And yes, my state was another one of those that decided to tax ‘affiliate’ sales — and yes, Amazon promptly cast off the affiliates from our state. I’ve never seen a study, but I am sure this was a revenue losing measure for this state — and probably a windfall for some of the neighboring states. You are under the impression that tax laws should make sense. They never have, and they never will. Clearly, small businesses in Colorado do not have any influence in the Colorado legislature. You have to grease some palms if you want laws that don’t discriminate against you. Ironically, Colorado does not even need the revenue, because they are literally swimming in money from the legalization of recreational marijuana. Here in Aussie we often refer to most US measurement systems as Retard Units, your tax mess makes your measurement units look positively modern & intelligent. At the same time we have just had major angst over the collection of GST (our closest equivalent to sales tax) on web based sales/purchases. At least we have only 1 rate (10%) everywhere. And as a bonus it applies to virtually everything. Yes, I’ve seen the hoops the sites I list on have had to go through with the latest change in Australian GST. I am not sure if I can legally ship books to Australia any longer. This seems like they are encouraging you to subvert the law by having a friend in another state sell your goods. The Colorado Department of Revenue is accepting comments on the proposed tax rule changes. Interested parties may submit written comments on the regulations to dor_taxrules@state.co.us . Comments will be accepted until November 30, 2018 at 5:00 p.m. Thank god I live in a state that doesn’t have sales tax, I don’t know how small online businesses could possibly realistically do that. Perhaps instead of this insanity they should just do a flat sale tax rate that applies to all in-state purchases of online goods from companies residing or nexusising(?) in Colorado and have it divided among the districts according to the total of the percentage of yearly online sales from in state. Then online companies would be paying a fair share of taxes to sales in state, but it would be simple to apply…ie customer in state pays 5% internet sales tax, not this nonsense of customer A in district 313 pays 3.78% and customer B in district 591 pays 1.51% and customer C in district 2 pays 13.9%. Jesus, even typing the simplified idea gave me a headache, sales tax is ridiculous. I’m fighting and voting against it every time our state tries because I see how ridiculous it can get!! Sure its “just one little” sales tax to start with, but then it explodes and breeds like bunnies. Many horrible procedures and decisions are blamed on ‘bureaucrats’, and they are sometimes deserving. But in this case, as in plenty of others, the guilty parties are the people that we elect. The legislators, mayors, county and city commissioners, and so on. We keep voting for candidates who craft clever slogans, but seldom craft effective policies. We, the electorate keep reelecting them, and bringing in additional ideologues who have little interest in the practical details and terrible side effects of there laws. Minor quibble. Just collecting sales tax isn’t enough to make a potential death thread to small businesses; there have to be a large number of fragmented tax districts to turn it into administrative hell. Pennsylvania only has 3: 6% state wide, 2% Philadelphia, 1% Pittsburgh; lesser jurisdictions are limited to other forms of tax. Having to submit to at most 2 extra jurisdictions isn’t going to kill anyone local. IF this is going to be implemented by all the states, as you suggest (and I fear that if Colorado gets away with this without having to go to the SCOTUS, it will), then it will be up to the individual sellers to band together, across state lines, to demand a single, unified sales tax for internet sales, regardless of physical location. And the seller would have to “sell” only via the internet, no brick and mortar stores. As an aside to our friend from Great Britain, Randy will have to give away one fact if he is able, but I live in a rural, unincorporated community that has no local sales tax. Within the County, which has a sales tax that we, in this unincorporated community, must pay, there is at least one incorporated city which charges a sales tax, along with the State’s sales tax. So, if Randy were to have to pay each entity, selling to me he would pay the County and the State, but if his sale was to my friend who lives in the incorporated city, he would also have to pay them. Confused yet? That is one of the reasons I loved living in Europe in the 80’s; regardless of where I bought something, all I paid was the VAT (Value Added Tax) and, if I understood the situation correctly, the seller only had to pay the VAT applicable to him. Perhaps, Randy, that is what is needed, a National Sales Tax similar to the European VAT. But it sounds so simple I doubt the lawyers would like, or go for it. For intra-state sales, such as Randy is talking about, I don’t believe the federal government (and hence the Supreme Court) would have any jurisdiction. Congress has authority when it comes to interstate commerce, but internally I believe the states can do what they wish. And most of the outcry, from all the various parties, historically has related to interstate and not intrastate sales. The states feels they are getting gypped out of ‘their’ revenue when their citizens buy stuff from elsewhere. I wish we would just ban all sales taxes. Personally, I’d like to ban property taxes too — collecting all government revenues through income taxes would be much simpler (and cost effective) to administer and be much more transparent to taxpayers regarding the amount they actually are paying. Plus it’s much less regressive, even for states that tax income at a flat rate, since the poor and middle class spend (and therefore pay sales tax on) nearly all of their income while the wealthy have the luxury of saving the majority of their incomes. Do all these separate tax districts actualy pay for themselves? Just in administration alone wouldn’t it cost more than what is collected? Paying for the accountants and for the ledger software, etc. Isn’t it just paying for the beuracracies? Yes sales taxes are a terribly bad idea and anybody who has read any Adam Smith understands how the “invisible hand” works to minimize the tax expense to a particular person, leaving those without the ability to make choices holding the bag (the cost). I live in Homer Alaska (total sales tax rate 7%). I also have a home in Anchorage Alaska (total sales tax rate 0%, yes no sales tax). Guess where I have all internet purchases sent? Guess where I make all major retail purchases? This List is to get Email Notifications of New Blog Posts. Includes both essay-type and Podcast episode notifications. By their nature, emails on this list are irregular.